World No Tobacco Day takes place on 31 May to raise awareness among the population of the negative factors of smoking. 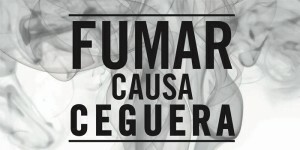 Smoking is a global epidemic that kills almost six million people each year. Ten per cent of them (600,000) are non-smokers who die as a result of breathing the smoke of others. Everyone knows that tobacco smoke causes a great number of highly-differing pathologies: respiratory problems, cardiovascular problems, cancers etc. However, few of us are aware that tobacco also affects eyesight and does so in a particularly destructive way.